today we performed for a luau at the San Juan Capistrano Seniors Center. always happy to be of service to our Senior Community. join the Steel Parade Facebook Fan Page! today i performed with the West African Ensemble “Pan Africa”, which features Master African Drummer Dramane Kone of Burkina Faso, for the Arts Education Series at the Lakewood Child Development Center in Lakewood, CA. this video is just one of the two performances we provided for the pre school students, parents, and faculty. this performance is part of our ongoing efforts to educate children of all ages of the music and rhythms of West Africa. Dramane Kone is a Griot from the famous Kone family of Burkina Faso and Mali. a Griot is a West African poet, praise singer, and wandering musician, considered a repository of oral tradition. it is very rare to have a Griot in Southern California, as we are honored to share his knowledge and energy to many children and adults in this area. the tradition and knowledge Dramane shares with us has been handed down, generation to generation, for more than 1000 years. this particular video brings a smile to my face. later this day, on a public on-line forum , i was told by a local “arts advocate” in my city that i needed to “get involved” and stop standing “on the sidelines” in regards to participating with the arts in my area. he went on to say that i should “roll up my sleeves” and make a change since “talk is cheap” and it is “the action that is very expensive”. this was in response to the fact that i did not attend a local arts “meeting/discussion” in regards to creating art in our area. its easy to see by looking at this video, i dont get a chance to participate in any art related forums in my area. my thanx to Master Drummer and Griot Dramane Kone for providing us with his talents, and for allowing us to educate the children in our area. more videos to come soon, as we are booked in many different schools and forums in the area. if you would like to have Pan Africa perform for your school, business, event, or party, please let us know. we are always happy to be of service. for the past few years, we have performed for the Open House Celebration at the Posada Whittier Retirement Community in Whittier, CA. Whittier Mayor Joe Vinatieri welcomed guests and said a few words. Phil’s view from the pan. Dancin’ all around. Filipino Tinikling Dancers performed as well. Gabe and Chris chillin on a break. Phil and Chris……same as always. always grateful to honor our Senior Community! join the Steel Parade Facebook Page! today we performed for an afternoon brunch at the Arroyo Trabuco Golf Club, in Mission Viejo, CA. we arrived early, so Gabe ran the Losi-LS2 Mini Truck around the parking lot for a few minutes. 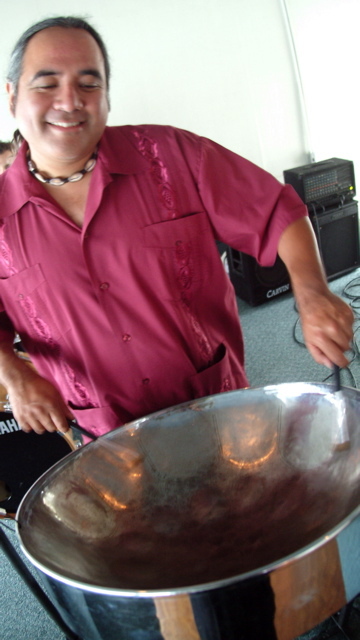 Phil was pretty enthusiastic to play steel drum and sing today! Gabe played djembe, as well as bass and vocals. another relaxing day at the Arroyo Trabuco Golf Club. for more info, visit the Steel Parade Facebook Page. today we performed for a private birthday party in Wesminster, CA. the party was for a family originally from Trinidad, so there was lots of dancing, singing, and good food! Gabe played bass and sang. we were given gifts of Kurma and Island Fruit Cake……..delicious! another fun afternoon in the sun! get up to date info by joining the Steel Parade Facebook Fan Page.